Beautifully fragrant, elegant blooms all summer long. Fabulous quality patio standard roses in 4 colours - red, pink, white & yellow. Incredible value, our patio standard rose collection will give you beautifully fragrant, premium quality, elegant blooms to enjoy all summer long. This Patio Standard Rose collection is superb value for money, and less than HALF normal nursery prices. They will produce summer-long displays of beautifully fragrant blooms for years to come. 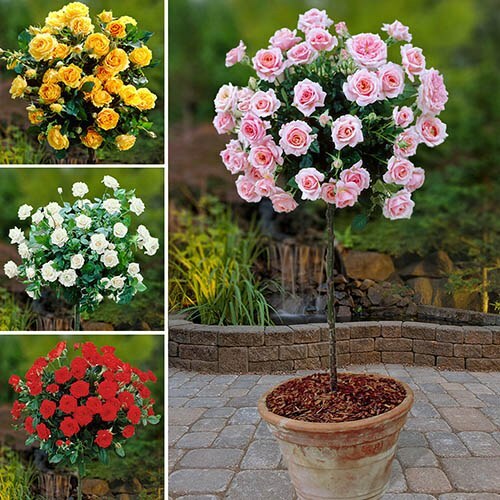 Also known as Tree Roses, they are the perfect way to add height and elegance to your patio – where a single bush will make a dramatic fragrant feature – or as a pair of potted specimens to dress a door or gateway. By ‘top grafting’ the flowering variety onto the straight stem of the rootstock, thereby giving the height, it takes expert growers a full three years to produce these gems. Rose 'Yellow' produces large, yellow flowers and blooms continuously from early summer to autumn. Rose 'Pink' beautifully demonstrates how the perfect rose should look. Its single, perfect buds are held over glossy green leaves from May to October. Rose 'Red’ is a classic red rose with deeply coloured, velvet-like petals through summer and into autumn, which look picture-perfect when spotted with early morning dew. Rose 'White' brings simple, elegant beauty to your garden. Its ice-white petals look particularly striking against its dark green foliage and blooms repeatedly from May to October. This unique Patio Standard Rose Collection features 1 each of pink, white, red and yellow. Approx 60 – 70cm tall, root to tip. Supplied as 4 bare root bushes approx 60 – 70cm tall from root to tip, with well-formed heads, trimmed back for winter,. Some may have green wax on cut ends, which prevents drying out. It will dissolve naturally when growth starts. Before planting, plunge bare root plants into a bucket of water for half an hour to rehydrate. Trim old flower stems to shape early each spring, just before new growth starts. Pick the right container for your rose - half barrels are a great choice, but any large pot with good drainage holes is perfect. Roses love sunshine and should receive sun for at least half the day, so position the pot with this in mind, remembering to position it before filling with compost as it may be too heavy to move once planted up. Use a loam-based John Innes No 3 with 10 – 20% multi-purpose compost added. Make sure that the mix does not include any type of granular or time release fertilizer as this may burn the roots. Feed twice for more blooms. Late-March/April and again Late July. Prune lightly to deadhead, shape, and control disease. Transplant into a larger container if you notice a decrease in blooms, and very 2 – 3 years to refresh the soil. It is important that container-grown plants do not dry out – water regularly.